Imagine the following scenario: you’re out running errands on a hot, humid day. When you return home, parched and exhausted, you grab a glass, turn on the faucet, and nothing comes out. You try a different faucet. Again– nothing. What would you do? Would you call the water company? A friend? Drive to the store? Would you walk seven hours to a water source without wearing shoes? When Patricia Parker was visiting Sudan in 2001, she observed that children were doing exactly this–walking miles and miles to retrieve water for their families. Stunned, she inquired about this practice and learned that the government was not supplying a sufficient number of water hand pumps for communities in Darfur. 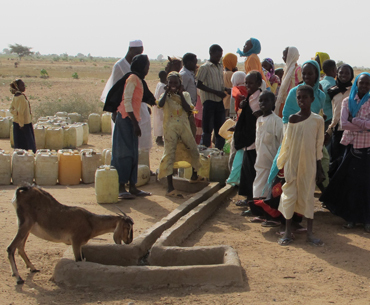 Hand pumps are fairly simple devices that enable individuals to access the aquifer under Darfur on location; they also limit the need to send children out on long journeys that risk their health and safety. As a result of this and other observations that “shocked her beyond anything she had ever seen in the world,” Patricia Parker decided that she couldn’t just stand by and watch. She needed to take action. In response to the extraordinary need she saw in Darfur, in 2001 Patricia founded an organization called Kids for Kids. Kids for Kids helps seriously deprived children living in remote villages in Darfur through long-term, sustainable projects identified and run by the communities themselves. In 2007, Kids for Kids opened a ‘Friends of’ Charity Fund with CAFAmerica, granting the organization an easy, cost-effective way to do fundraising and awareness building in the United States. Patricia has always been involved with charity work, but strongly advocates for sustainable methods that empower communities to operate on their own–instead of providing financial “handouts.” This philosophy is at the heart of Kids for Kids, and it is strongly exemplified in its programming. Since 2001 Kids for Kids has provided or restored over 120 hand pumps; it has provided 13,000 goats and over 2,000 donkeys to families to use for health-improving and income-generating purposes; it has also provided tree seeds, blankets, and mosquito nets. In the coming months, Kids for Kids has plans to provide first aid training, midwife training, and enhancements to its tree planting program. As an example of sustainability, Kids for Kids lends the goats instead of giving them, because after two years the family passes the same number of offspring to another family in need, and then they pass on more to yet another family– it is a microfinance scheme that really works. The relationship between Kids for Kids and CAFAmerica is a strong one, and it continues to be “an essential one” for Patricia’s organization to garner valuable support in the United States. Although Kids for Kids is a registered charity in the United Kingdom where it is based, Patricia did not have the financial means to create a separate 501(c)3 in the United States. She was able to turn to CAFAmerica’s Friends of Charities service to set up a way for US donors to support the organization in an easy, tax-effective way. Patricia does lament, however, that attention on Darfur has subsided since the initial “publicity machines and celebrity advocacy of the early 2000s” lost momentum, despite the critical ongoing needs in the region; this is tragic as conditions in remote villages are deteriorating badly in the wake of ongoing violence. In spite of this, Patricia remains committed to her own vision of a Darfur in which children grow up with everything they need to thrive. When speaking with her, it’s impossible not to hear the unwavering hope, passion, and determination in Patricia’s voice. You may support Kids for Kids through CAF America with a Donor Advised Gift (min. amount $500). Please note: In 2013, due to of a reduction in the number of donations, it was no longer viable for the Kids for Kids Friends Fund to remain open for gifts under $500. However, the fund can still receive donor advised grants above that amount. Please contact www.kidsforkids.org.uk for further information. Photo provided by Patricia Parker.